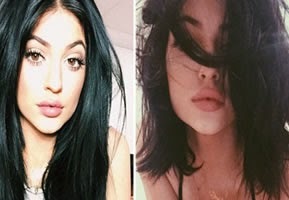 Klie Jenner (17) is the younger sister of the Kardashian clan and, in fact, is also one of the most beautiful , for the moment, has not as many surgeries as Kourtney (35) Kim (34) and Khloe (30 ) ... although visited the theater a couple of times. While the other is Kendall (18), who became supermodel and scrolls to the well-know designers, Kylie also seeks to differentiate itself from the olders. With these shares of voluptuousness and sensuality, and until a few days ago, a thick and long hair. But Kylie tired and visited her stylist to do a bob cut, the latest hair trend.